Calling all 1st Grade Teachers! Here's a great resource for you! 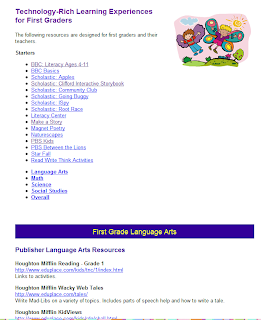 Check out this page at Technology-Rich Learning Experiences for 1st Graders! You'll find tons of resources for technology integration that is sure to enhance the first grade curriculum! Check it out at http://eduscapes.com/sessions/experience/first.html.